As horrible as the Cross was, it wasn't the final chapter of the Jesus story. Jesus died and then rose again. 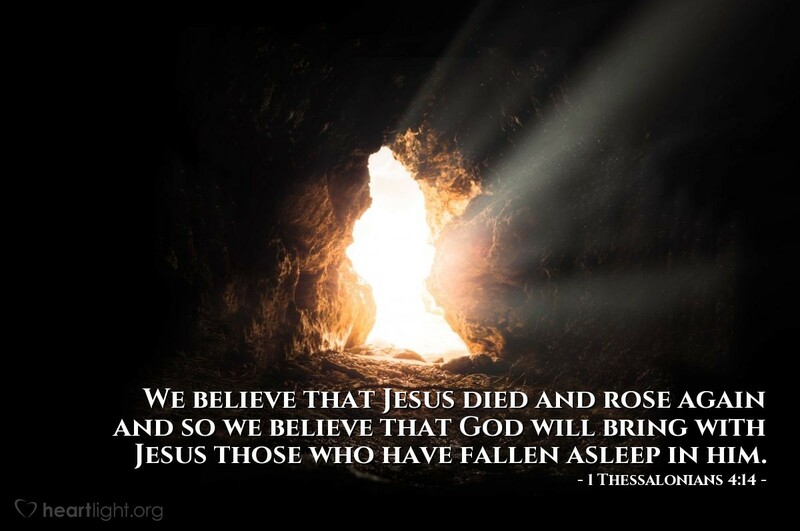 We can believe two things because of Jesus' resurrection: 1) that Jesus will return in glorious victory for those who have believed in him, and 2) that we will be with those we love who have fallen asleep in Christ when Jesus comes again. Holy and Almighty Father, thank you for raising Jesus from the dead and giving me the assurance of eternal life with you, and with those I love who have already passed from this life into death. I look forward to the day Jesus returns in glory, with the angels of heaven, and brings complete victory over death. Thank you in Jesus' name. Amen.